Who Exactly Are Your Influencers Influencing? With influencer marketing spend expected to reach $5-10 billion by 2022, it’s more important than ever for marketers to deliver data-driven and measurable influencer strategies. A common and persistent question we hear from influencer marketers is, how do we confidently select and vet influencers for our business? Until recently, the default criteria for vetting influencers was audience size. However as influencer marketing becomes more sophisticated, there is a greater pressure from executives to truly understand how an influencer impacts their audience and who exactly an influencer is influencing. In our research, 83% cited a top priority to “identify and build one-on-one relationships with industry key influencers.” Without selecting the right influencers aligned to the right audience, it’s unlikely you’ll deliver against marketing objectives. You need to uncover what an influencer’s audience cares about in order to create an impact. This is key to making trusted decisions with strategic data to ensure influencer marketing dollars are spent effectively. 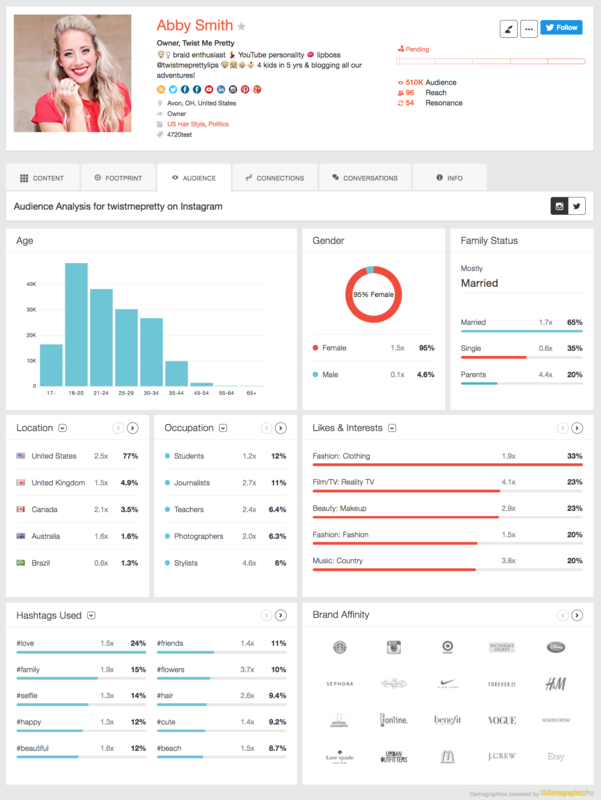 To address this show-stopping problem, Traackr has partnered with Demographics Pro to surface influencer audience insights for influencer selection and customer targeting. A leader in social media audience analysis, Demographics Pro enables Traackr to provide rich Instagram and Twitter demographics and psychographics for each influencer. With Traackr’s newly released ‘Audience Insights’, brands are able to prioritize influencers whose audiences align with their ideal customers. This brings a new level of optimization that will deliver cost, time, and resource efficiencies required to scale the practice of influencer marketing. ‘Audience Insights’ provides marketing executives with strategic data to ensure influencer marketing dollars are spent effectively by pulling back the curtain on which interests and brands an influencer’s audience cares about most. Traackr’s ‘Audience Insights’ is now available for customers subscribed to the Enterprise Premium plan. To learn more about reaching the right end customers with the right influencer profiles, get in touch with us.